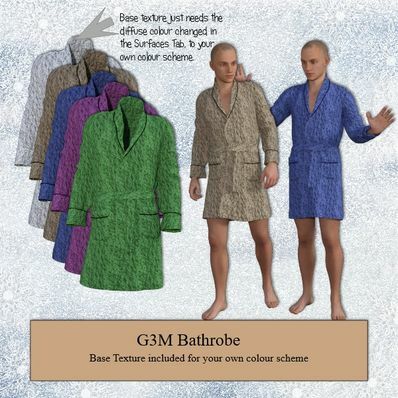 Bathrobe for Genesis 3 Male for use in Daz Studio 4.8. I have also included several Textures. Use Base Texture to add your own diffuse in the Surfaces Tab. Thank you very much for this nice bathrobe! Thanks Wendy for creating these bathrobes for our guys!! Thank you. This is really nice. Thanks for your many generous contributions to the 3D artist community. Thanks a Lot! Very useful item.